I’d been following Kabuki’s work as part of the Makai production team for years – tracks like Omen, Beneath The Mask and Northstar amongst many others were massive personal favourites of mine and tracks that I still play occasionally when playing out. 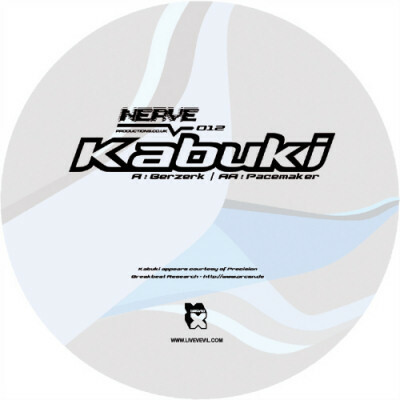 I’d spoken to Jan Kabuki on AIM a few times and we’d swap dubs etc, when he sent over “Pacemaker” I jumped on it and asked if we could have it for Nerve straight away – IMO it was perfect for us, a quality chunk of liquid funk with a techy edge and with Kabuki’s usual amazing production! We added “Berzerk” later on but ended up making it the a-side after advice from the distributor that it was the more dancefloor of the tracks so would be better suited on the a-side. I do love the track, it’s a lovely bit of kinda bouncey electroy drum n bass, but for me “Pacemaker” was the one – absolutely brilliant track. This was later featured on Kabuki’s album “Signal To Noise” and I can’t recommend this album enough.